Apartment flooded from the recent Spring storms in Alliance, Ohio. During the Spring months severe flooding from storms have devastated apartment complexes and commercial properties. Before the next storm rolls through the area here are some points of interest to consider to prepare for a storm. • Protection of Common Areas. Prepare and protect the common areas of a property, such as boarding up windows, obtaining sandbags, trimming trees, moving furniture, storing items or equipment and securing records or any other valuable property. • Emergency Contact and Access. Property Managers should leave contact information for all residents. Residents should leave accessibility to the property manager in case emergency access is needed (in particular, in the event of flooding and water intrusion). • Insurance. Make sure that your property has all the required insurance policies and make sure they current and effective. • Records of Property. Document and back up all records, photos, videos, etc. reflecting the state of common element prior to a storm so that information can be later used in connection with potential claims. • On-site Staff. Have a plan on where the management staff will be on the premise when the storm hits the area and who will be designated to return first after the storm to access the damage. • Generator. If you have a generator make sure that it is working properly. • Evacuation Plan. Make sure there is an evacuation plan in place. If evacuation is necessary, make a designated person in charge to make sure every resident has left and the property has been secured. At SERVPRO of Northwest Stark County, we offer a comprehensive Emergency Ready Profile to all commercial property owners. Be prepared today! Call us at 330-497-4600. This flooded basement in Canal Fulton was caused by the recent spring storms. Handling water damage from a storm can be a devastating ordeal for a homeowner. If you have experienced an unexpected form of disaster from a storm such as water damage to your basement or storm damage to your roof, then please feel free to contact one of the experts at SERVPRO of Northwest Stark County today. Water cleanup may seem like a near impossible task for some circumstances, however, it does not necessarily have to be if you make the decision of contacting the right restoration company. Water in a home is something that you will need to consider should you experience flood damage from a natural disaster. The water damage that has just occurred may leave you in shock, but it is not something that should put a major setback in your life. Water in home can be removed through a drying process that our technicians are IICRC certified to complete. SERVPRO also uses moisture meters to determine which area of your structure is wet and dry. It is important to choose the right company that will properly restore your home as well as communicate with the homeowner and the insurance company. SERVPRO of Northwest Stark County has been working with Canal Fulton homeowners for decades and has become a well know name throughout the county. Please read some of our great reviews. Visit http://www.SERVPROnorthweststarkcounty.com for more information on storm damage cleanup and restoration or call 330-497-4600. Air movers drying out basement carpeting from a flood. Spring is coming and water damage is coming with it. As winter thaws away the melted snow can be detrimental to your home. In order to prevent water damage in your home this season take these precautions in order to stop or notice water damage before it causes harm to your family and home. Basement pumps - Install a sump pump or sewage back flow valve and keep a battery-operated backup in case of power failure. Debris Removal - Clean gutters at least twice a year to prevent ice dams and debris blockage. Exterior of house - Inspect windows and doors for cracks around the edges. Keep all walls and side paneling painted and well sealed. Foundation cracks - Inspect your foundation on a regular basis for cracks that can be small, but can create a lot of damage. Monitor your water bill - A simple way of detecting a non obvious leak is by watching for a non accounted for spike in your water bill. Grading & Landscaping - Make sure your grading encourages water flow away from your house. If it does not think about altering it. While also trimming trees and avoid planting shrubs near pipes and other utilities. Roof - Ensure that your roof is maintained properly. Check for sufficient insulation and that your ceiling is airtight. Disconnect hoses - Standing water in a hose can cause freezing and lead to a ice blockage in the pipes. This can cause damage to walls, floors, and foundation. Water Main - If you leave for an extended amount of time shut off your water main to decrease your chances of standing water and frozen pipes. Water Detection Devices - Invest in water detector which is a small electronic device that sounds an alarm when its sensor is in contact with moisture. No one can prevent water damage in all means, but taking action on preventing the damage can prevent common causes of damage and save you from costly cleanups if the damage was to strike on your household. 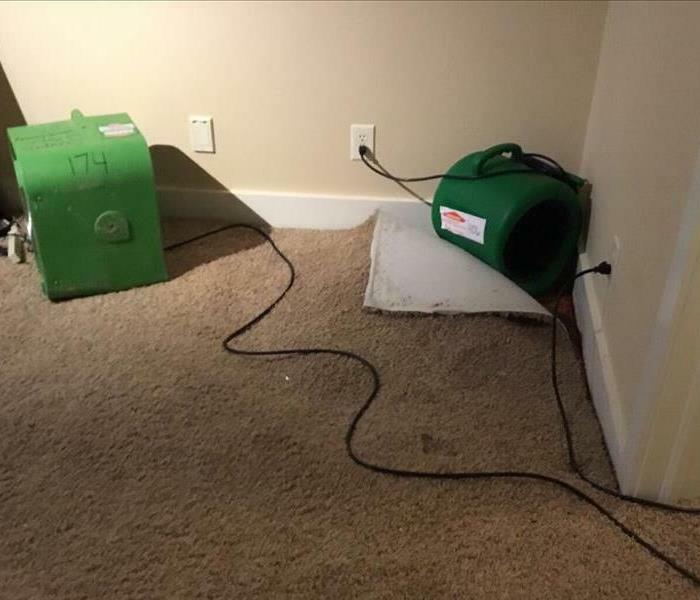 If water damage does reach your home contact SERVPRO of Northwest Stark County at 330-497-4600. Fire Damage to a Home in Massillion, Ohio. After a fire has damaged your home or business, there are many people involved in restoring your structure to pre-fire condition. Not all structures maybe insured for a fire loss, but in most cases an insurance will cover the loss. The insurance company, agent and adjuster will work with the homeowner to address the damages and work with the property owner to restore the structure under the insurance policy. The homeowner and the adjuster will contact a restoration company to help clean up and restore the property. The charges for a restoration company services are only a fraction of the cost of replacing, which lowers the cost of the claim for the insurance company. SERVPRO of Northwest Stark County will provide these services. A fire damage is a traumatic experience and our crews have the experience and empathy to work with the adjuster and homeowners. We provide quality service and close attention to the customer's concerns to help restore their lives, belongings, and structure as if the fire never even happened. Our crews are available 24 hours a day, 7 days a week, even on holidays. We are a phone call away at 330-497-4600. SERVPRO of Northwest Stark County crews at work! We strive every day to ensure that our quality of work is up to the highest standard and we are always thrilled to get positive reviews from our customers. "Had a flood at my place, and wow! These guys made everything easy as can be! This was my first experience with a flood, and they were so helpful. So informative. And so, comforting about how everything was going to go! Hopefully this never happens again, but if it does, I know who I’m calling!" "The SERVPRO crew came to our home quickly and professionally. The crew was polite, professional and hard working. They all made our worries of how we would manage our waterlogged basement seem not so much a worry. Thank you for your knowledge, support and hard work in such an awful situation." No job is to small or too big for the crews at SERVPRO of Northwest Stark County. We are always here for our customers to put their water damaged home back to preloss condition. Call us 24 hours a day at 330-497-4600. Contact one of our sales representatives for a SERVPRO Emergency Ready Profile. Is your Building Ready for a Water or Fire Disaster? Did you know that 50% of businesses do not reopen after a water or fire disaster? It's time for you to be "Ready for whatever happens". SERVPRO of Northwest Stark County wants to offer a Emergency Ready Profile (ERP) to commercial buildings. It is a free assesst with no obligation comprehensive document that contains critical information about your building, including emergency contact information, shut-off valve locations and priority areas. Having this information in hand helps you and SERVPRO of Northwest Stark County to react to an unexpected event like a flood, pipe break, sprinkler malfunction, toilet overflow or fire to quickly and effectively help minimize interruption. And, because disasters are unexpected, there is a Smartphone app and web version of the Program available to provide you with access to your ERP 24/7. Plus, it puts you as one of our top accounts and therefore be at the top of our list for any emergency clean up and mitigation during storm situations. If you are interested, please contact our office at 330-497-4600 and ask for one of our sales representatives to schedule an Emergency Preparedness Plan (ERP) for your commercial building in the Canton Ohio area. Establishes SERVPRO of Northwest Stark County as your professional disaster mitigation and restoration provider. Identification if the line of command for authorizing work to begin. Please don't wait until a water or fire disaster strikes your building, CALL US TODAY! A fire damaged a home and all its belongings in Massillion, Ohio. Hoarding is a disorder that leads to an excessive accumulation of items in a home because the homeowner can not part with their items. The excessive accumulation is not only unhealthy for the individuals who live in the home, but is also unhealthy for the home. 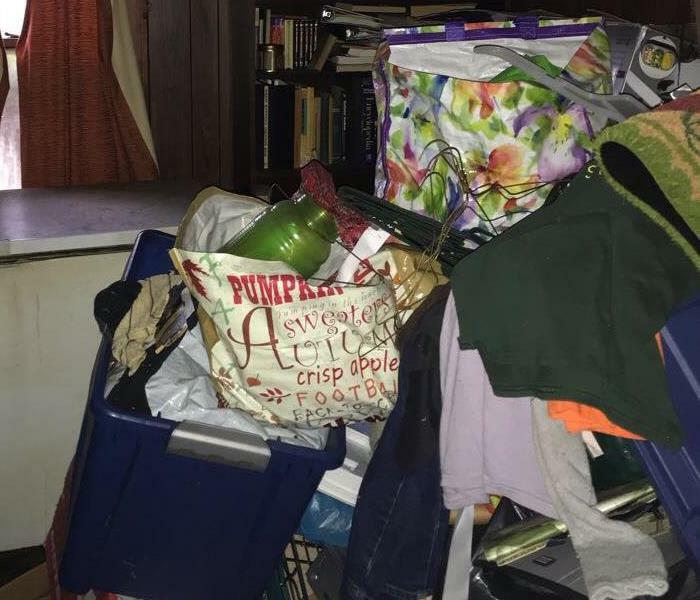 The abundance of ‘stuff’ can lead to physical injuries, fires, structural damage, and a toxic environment for the hoarder their family and their pets. It is important to know the effects of hoarding so you can stop or help someone stop before it is too late. An individual living in clutter is susceptible to many physical injures. The obvious being increasing risk of falling and being hurt from the clutter collapsing. Although, there are many other ways an individual can face physical harm that can go unnoticed among the disorder of the home. As the clutter accumulates the house becomes dust ridden and the air quality increasingly becomes poorer. With poor air quality comes various respiratory problems and stale air. When stale air increases it reacts with the higher humidity levels and the decaying food and animals in the house causing mold starts to grow. The growth of mold can cause serious structural damage and health problems. A homeowner with a hoarding disorder often leaves food uneaten and lying around causing it to decaying resulting in pet infestations. There can be nests of insects and pests in houses that a homeowner may not even know about. These pests can lead to major structural damages, a house fire, or transfer disease. Fire hazards are a big problem when it comes to hoarding. The excess amount of objects are more likely to cause a fire do to the abundant amount of flammable objects so close to incandescent bulbs and stoves. The high potential of pest infestations also increases the risk of a house fire because of their ability to chew through wiring and cause electrical failures. Another common hazard found in a hoarders house is faulty appliances which can easily cause fires. 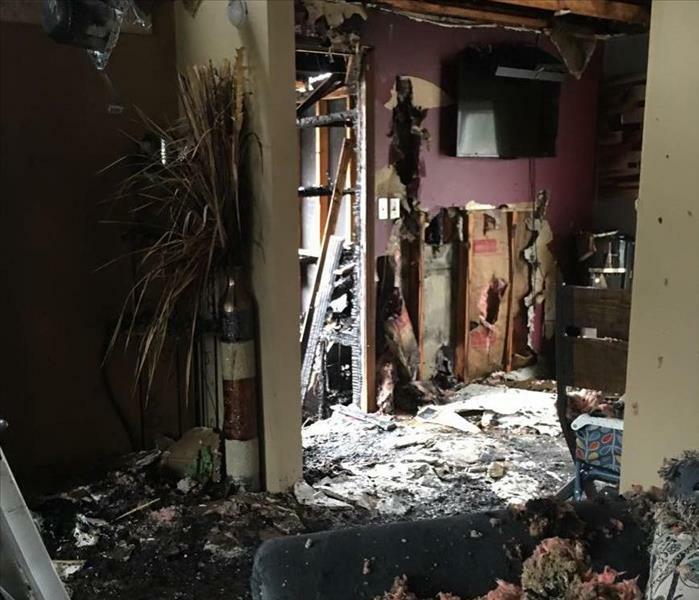 If a fire does spark up in a house full of clutter it is not only hard to escape through all the stuff that blocks the windows and doors, but it is also hard for rescuers to save the residents that are stuck in the flames. With so many flammable objects fire can spread quickly and smoke develops quicker making it even harder for residents to live. Structural Damage is common is houses that face hoarding. Homeowners have limited access to different systems in their house so they do not receive necessary maintenance on systems ranging from sprinkler systems to plumbing. If there is a pest infestation the rodents can make holes in the walls and ductworks while ruining wiring, insulation and the base structures of the home. The mold from the stale air and water damage damages the structural materials and can compromise the integrity of the home. The most apparent structural damage that can occur is due to the abundant clutter distributed through the house that can lead to a collapse of floors and walls leading to an unlivable house or can even injure the residents of the home. Disaster Preparedness - Are You Ready for a Power Loss? 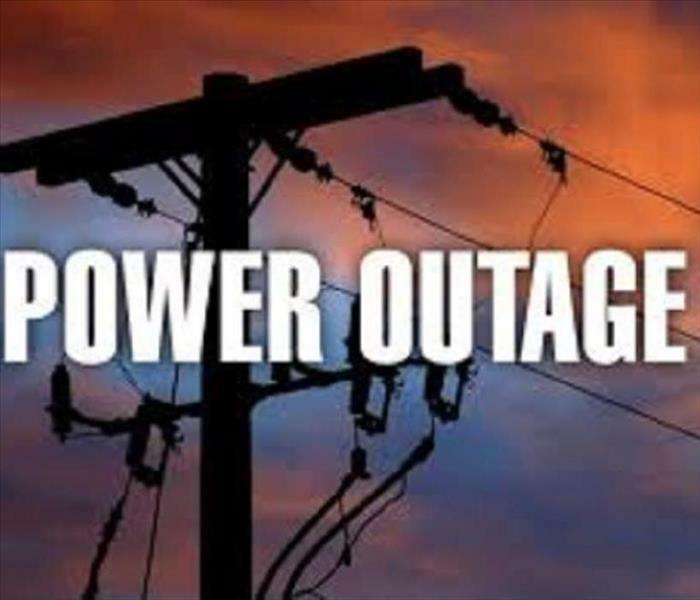 Be prepared for a Power Outage in Stark County. Power outages are common and detrimental to many families. From the years 2008 to 2013 an average of 847,785 people were affected annually by electric outages. These individuals faced an average of 9,968 minutes, 166.1 hours, a year in a power outage. Power outages can be the cause of animals, vehicle accidents, equipment failure, and spikes in electrical supply. Although the leading cause of outages is weather. Weather accounts for 80 percent of power outages. This is why it is necessary to be prepared for a power outage when storms build up. Disrupted communications, and transport, closed businesses including grocery stores, food spoilage, and contamination, along with flooding can all be associated with the loss of power. To protect yourself from facing these situations prepare for the worst so you can survive during the outage and be safe after. To prepare for an outage take inventory of items that rely on electricity including your telephone. Account for medicine and medical devices that rely on refrigeration or electricity. Have batteries and flashlights that will assist you when in the dark. Have enough nonperishable food to last you the length of the outage. Install carbon monoxide and fire alarms with battery backups to ensure safety during the outage. Finally, Be aware of what is happening in your area by following weather reports. If an outage occurs don’t panic. Keep your refrigerators and freezers closed in order to keep food fresh. Do not use a gas stove. Disconnect appliances and electronics to avoid electrical surges. Be aware if you have medicines that are dependent on electricity or refrigeration and take care of them. Once you are safe contact neighbors and people close to you to see if they are safe. After the power comes on to ensure future safety throw out all food if it was subjected to temperatures below 40 degrees and any medications that could have been spoiled. Also replace any materials you used to be safe for the next outage. It is important to be prepared and know the risks of a power outage in case you find yourself in the situation. Have an emergency plan and be prepared so you can stay safe while having no power. SERVPRO of Northwest Stark County is the team that is faster to any size disaster. When you face damage to your commercial properties SERVPRO will be there to help. We can restore properties that have fallen to all different size water damages from floods, toilet overflows, water leaks, pipe breaks to sprinkler malfunctions. We will make it our priority to get your buildings back to working order quickly before the water damage seeps into flooring, carpets, baseboards, and walls damaging the structure of your building. 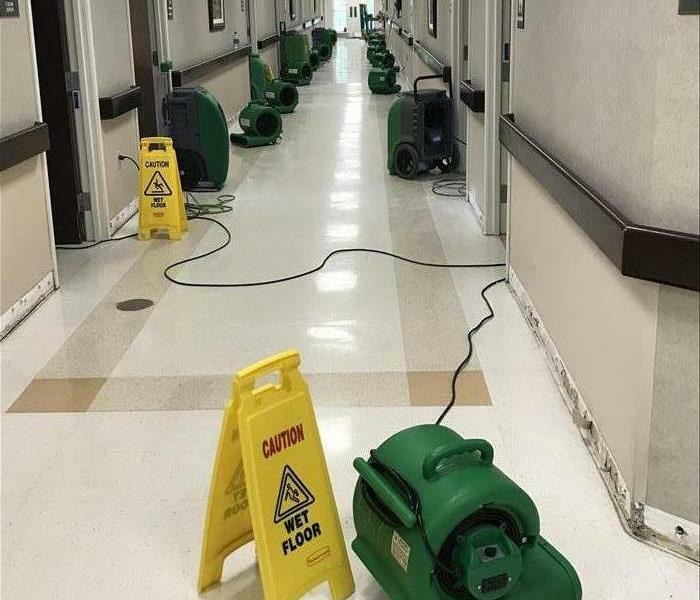 SERVPRO of Northwest Stark County understands that water damage is a huge inconvenience to your business, but will work quickly so your business can get back to its normal day to day functioning. We have the equipment, training and experience to find and dry water before secondary damage set in. Fast action saves time and money, so call SERVPRO of Northwest Stark County for 24/7 Water Damage Cleanup and Restoration. Unfortunately, even if you are incredibly prepared for a fire in your home it will still cause damage to your family and your home. A fire can cause structural damage and causes a number of hazards related to water damage, soot pollution and unhealthy smoke levels. In order to remove these hazards from your home smoke odor removal will have to take place. Smoke Odor removal is a complicated process. It requires identification of the odor and it’s conditions, along with the severity of the odor. The severity of the odor depends on many factors, the most important include: size of fire, length of exposure, size of room affected, and materials that have burned. No matter the severity of the odor it is important to have it removed in an efficient manner. The science of identifying and eliminating odors is complicated, so call SERVPRO of Northwest Stark County at 330-497-4600 and we will take care of all you fire damage restoration; leaving your home like the fire never even happened. 2/26/2019 - Disaster Preparedness - Are You Ready for a Power Loss?